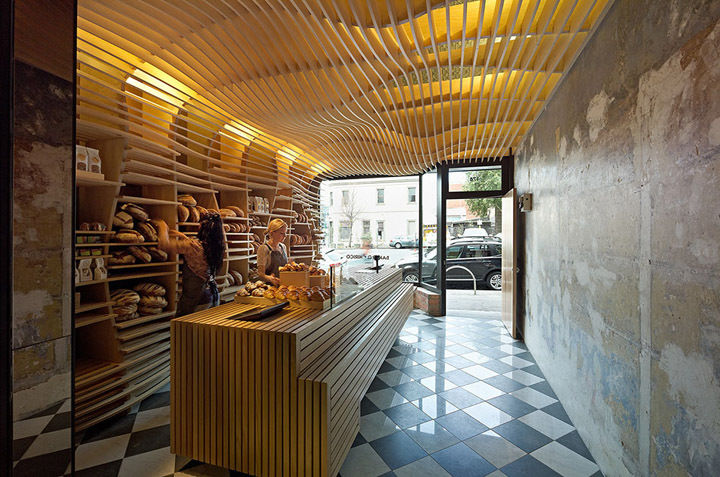 Designed by March Studio, the interior of the Baker D. Chirico store in Carlton, Australia, boasts beautiful wavy walls and ceiling in plywood. A trendy space to buy our good old French baguette! The bakery shelves accommodate loaves of various sizes and cool the breads coming fresh out of the oven. The counter looks like a big chopping board and conveniently includes built in scales, crumb trays and knife holders. The black and white checkerboard floor adds an authentic and sophisticated touch to the interior. I love how this pattern is echoed in Baker D. Chirico visual identity and in the printed wrapping paper.